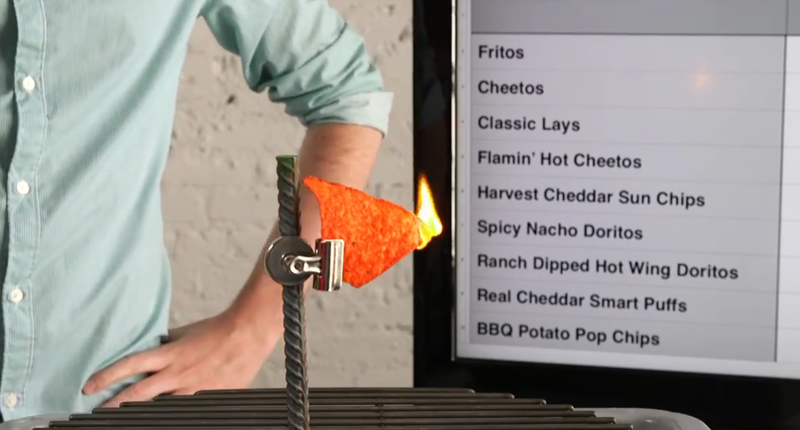 A guy named Zach emailed our tips line to let us know that Doritos make for excellent kindling for a fire. So our staff decided to experiment with a bunch of snacks you might bring camping for their multi-purpose potential. “Experiment” is a generous term; we took chips of all different sizes and surface areas, lit them on fire, watched them burn, and arbitrarily decided when to douse them with a cup of water to keep things moving. Every snack—except pretzels, don’t use pretzels—burned at least briefly, and their burns each had different qualities. Some oozed a deep, red-orange cheese-blood as they went up in smoke. Others yielded a stoic, sustained burn. The most oily snacks of the bunch disappeared in mere seconds. Pure duration of burn is probably not a useful measure in itself; look for intensity and consistency of the burn. The olive oil seaweed chips, for example, erupted at the first touch of flame, but it all happened too fast for a camper to properly stoke a fire. A Cheeto might smolder weakly for a long while, but the flame at any given point could be pathetic. You’ll probably want to strike a balance between the two; Fritos were a viewer favorite. But basically all of these—except pretzels, forget pretzels—should work given some patience. Or just pick whichever one you wanna eat.